Shoot first, why bother with questions. 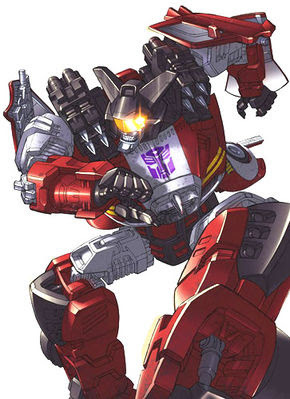 Ricochet, the twin brother of Autobot Jazz, is the result of Prime's experiment in splitting an Ember in two and joining each with a new body. Though Ricochet and Jazz were activated seconds apart, the two couldn't be more different. Trained by Prime to serve as one of his elite bodyguards, Ricochet is known for his wild attitude, acting first and asking questions later. Many times this leaves the Autobots without a hostage or serves to eliminate anyone who plans to usurp Ricochet and take his position by Prime's side. Ricochet works extra hard to betray others first, believing that those around him are out to sabotage him. Much to his annoyance, his twin brother Jazz has always been Prime's favorite. Though Ricochet only "acts" crazy from time to time, some fear that this knowledge will lead to it no longer being an act.